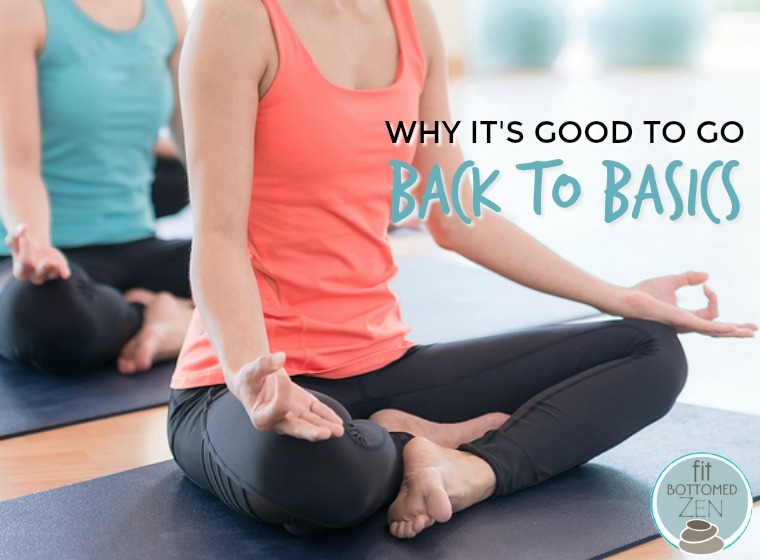 If you find yourself in a yoga rut where you are simply going through the motions with little enthusiasm for the practice, then it may be time to switch things up and head back to basics. Although it may seem counterintuitive — to take beginner’s classes if you’ve been doing yoga for years — the benefits of re-learning the foundations will improve both your asana and your mindset. Yoga is a journey of the self, complete with all the twists and turns we come up against within ourselves. It’s nonlinear. Returning to a beginner’s class might just be the thing your practice needs to advance to the next level. The issue many people face is that a lot of the foundational elements, like the breath, don’t carry the same excitement as flipping upside down into forearm stand. And the thought of slowing down to focus only on our inhales and exhales may not appeal. But to take a full class and only focus on your breath could do wonders for both your practice, and the rest of your life. This is something I experienced recently. In lieu of taking my regular 8 a.m. class with my usual teacher, I ended up in the 8 p.m. class with an instructor I knew nothing about. The after-work crowd felt a lot different than the early-birds who I usually practice with. Maybe it was because they were coming from a full day of stress compared with the morning crowd who haven’t yet built up the tension in their bodies. Or maybe it was the coupon sale that I noticed several people were checking in with. It appeared these were people new to the studio, and perhaps even new to yoga. Regardless, when the teacher began class by saying we would go back to basics and spend the full hour on the breath, I was annoyed. It took awhile for my mind to unwind from all the agitation. I kept telling myself what a waste of time it was being there that evening because I was not a beginner. I wanted to move and flow and sweat! I didn’t want to stand in Tadasana or worse, lie on my back, and pay exclusive attention to the breath. But I did. And when I finally allowed my agitation to pass, I could pay attention to the instruction given by the teacher, which inspired new inquiry from me around my breathing patterns. Why did I tend to hold my breath a little after each inhale? And why does my breathing get shallow from this slight retention? It’s these kinds of questions that we must ask to advance our practices, and go deeper into ourselves. By instilling a sense of curiosity to what we do — even if we think we’ve already done it, and we know everything there is to know — we shift back to our beginner’s mind, which gives a fresh perspective both on the mat in the rest of our lives.